News: Half & Medio Kickstarter launches today! Ryan Dean is a resident of AS220, member of AS220 Industries, and former Artist in Residence at the AS220 Drink and Ink. His Kickstarter video was filmed onsite at the AS220 printshop. Check out his Kickstarter and support it today! 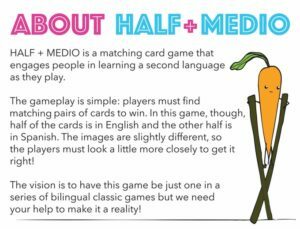 Half & Medio – A Bilingual Matching Card Game!